Just received my new Kappa K466 top box! I've been looking for a replacement for my 6 year old $36 generic top box. I was wanting something with a bit more room, I could barely close it on my full face helmet and you could forget about putting a jacket in with it. After checking out Givi and Shad I just didn't feel those plastic boxes were worth what they charge for them, at least not to me. After an internet search I found the Kappa at Motostorm. It's amazing how much cheaper those top boxes are overseas. With the optional backrest and shipping it was only $177 which is about half what anything comparable in the states costs. Already have it mounted and I think I'm really going to like it. Installed a new Road 5 rear tire yesterday. Had to do a little sanding on the valve stem hole with a dremel tool to get my new Moto-D angled valve stem to fit without folding over the rubber seal. Have an Evotech radiator guard to go on, but after fighting to get the old tire off and the new tire on the rim and back on the bike I didn't feel like fooling with it. I'll do it another day. Those 15 minute tire changes you see on videos just don't work out that fast for me! I can only attest to my experience with Madstad. I went with a taller than recommended at 24" primarily because I wanted it to drop down a little further in the front as I think it looks better that way. I have commuted all winter on the bike and it does an excellent job of blocking wind and buffeting. Even better it really blocks out the wind noise, I have no trouble listening to the radio on my Cardo bluetooth freecom without having to turn it up to painful levels. The Madstad mount also allows a wide range of adjustment with both angle and height adjustment, making it easy to find a position that suits your preference. 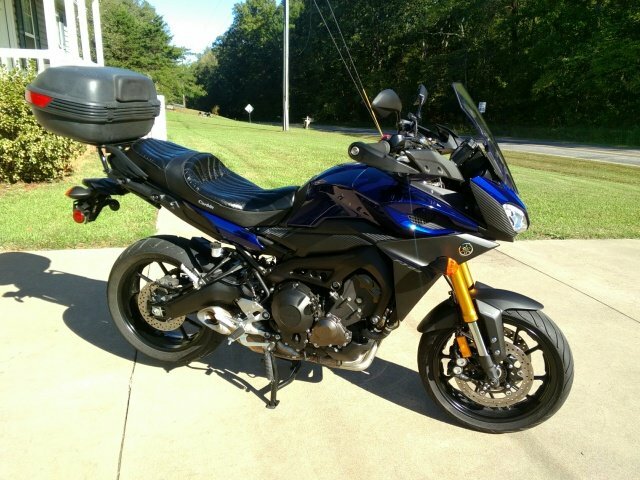 Anyone have a stock FJ-09 Front seat to Sell? I replaced mine with a Corbin seat shortly after I got the bike last August 31st. Stock seat probably has less than 1000 miles on it. $60 plus shipping, will include the rear seat for another $40. I haven't noticed my Corbin seat doing any moving. They are stainless steel, I was pretty sure of this but I just went and checked with a magnet, it didn't stick. Yeah, I've got a set of those valve stems now waiting for my first tire change. I have about 6500 miles on my original tires now and the rear tire is pretty much worn out. I have a Road 5 tire coming next week. Just checked out the Brosh summer jacket, and like so many vented or mesh jackets it's only offered in black. I don't understand this, as long as you're moving and getting air flow this might be fine, but due to road construction and heavy traffic on my past summer commutes I've spent a lot of time stopped or barely moving. Sunlight on a black jacket gets hot fast under those conditions. Seems like it would be much better to have a white or light colored jacket for summer riding. I got a 2017 in August of last year for $10,200 OTD with the three extra years of extended warranty. The GT wasn't available around here at that time, but now they are listing for about $13,000. Add the extra warranty and taxes and other BS and I'd probably be lucky to get one OTD for $15,000. I added a Corbin heated seat, Madstad windscreen, McCruise, Givi crash bars with highway pegs, Yamaha heated grips and rear rack, rubber topped foot pegs and different hand guards. I already had a top case. All of these additions came in at just under $2000. So for $12,200 the FJ has everything the GT has except for the extended swingarm, the TFT dash, quickshifter and hard bags. Even if I had the GT I'd still want everything I added to the FJ except the cruise control which it already has. That would bring the cost of the GT up to about $16,300 So for $4000 less, or $3000 less if I got hard bags (which I don't want) I think I did well to go with the FJ-09. I have the 2017 model with a top box. I got about 52 mpg during the break in period but now I'm averaging 45mpg. I suspect if I kept the rpms below 6000 like during the break in I would be up around 50mpg again, but what's the fun in that? Twist that wrist and have some fun. 45 x4.8 gallons is 216 miles per tank. I just added some Rox risers that displaced the bar 1 1/2" up and 1" back. The brake line was ok although I did make an adjustment at the clamp per Betoneys suggestion, although the wiring harness going to the left controls is very tight. I think this is the max displacement you can get with stock wiring. I think 2" would be too much to work. Tinker, those handgaurds were for a 2004-2011 650 vstrom. They were a bit of trouble to fit up. I used a dremel tool with a sanding drum and burr to cut clearance for cables and other parts to get a fit. And as I recall I had to use a combination of hardware from the fj-09 and what came with the guards to get them mounted. You have to get a bit creative. I do like the results, closer to the hands and much more effective than the originals, and in my opinion better looking. Also as a bonus extra clearance at full lock so as to prevent interference with after market wind shields.